My name has always given me trouble. Even after I learned to write out the letters, I could not say it out loud. As a child, I struggled to pronounce certain syllables, but I always felt too old to ask the right way to say my name. As it turned out, no one knew, not even my parents. I thought my sisters got off easy because they were named after flowers, but when they were ten and seven and I was eight, our parents changed our names. I remember my father, his hair cropped close around his ears, whispering my name before lowering me into the tub. Under the water, I opened my eyes and watched the bubbles rise from my nose. A heart-shaped barrette had come undone and floated to the surface. The new names weren’t so bad, except at school and on the bus. My older sister used a magic marker to scratch out her old name on her backpack and write in the new one. Our teachers always forgot and said our old names first and had to correct themselves. When I was older and started making friends, they called me by my last name, a common American name, one syllable. But then I married a man with a very long name that, at first, I did not know how to say. I took his name to show him that I loved him but also because I felt changed by it: a new name like a new skin. My husband was a poet, but he didn’t write the sort of poetry that people normally like to read. He liked to take words that had already been written and break them apart and blend them together until they became meaningless sounds. Then he would mix them up again so that they became words without sound, words that were impossible to say. My husband liked to tell me facts. He could name every fish in the aquarium, even the strange ones that grew appendages that looked like traffic lights and the ones that burrowed deep beneath the sand. He could name every constellation in the night sky. We named things without knowing that they could already be gone, he said. My husband was happy sometimes, but most of the time he was unhappy. His hands were often cold, but I thought that if I held them long enough, I could warm him with my heat. Eventually, he slept with his back to me, though he didn’t pull away when I circled my arm around his waist. After he died, I slept alone on top of the covers of our bed. My sisters told me that I needed to move on, and the first time I brought a man home, he pulled back the covers of our bed. He called me by the name my husband had called me and fell asleep beside me. But I lay awake under the sheets that did not smell like this new man but smelled like my husband whose name I could not say. I breathed him in, holding his cedar smell inside my mouth. I bought a small bird to keep me company. 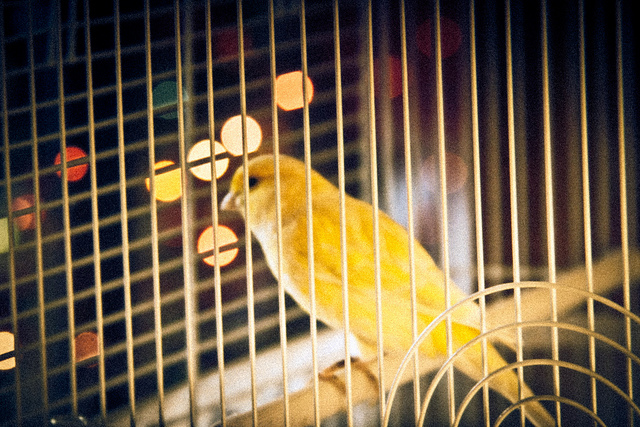 A little yellow bird that sings in the night and tilts her head when I look at her through the bars of her cage. I’ve been trying to come up with a name for her, but every name I say doesn’t feel right for one reason or another. She doesn’t seem to mind. Instead, I sit at my desk and listen to her sing, and when I feel there is too much to say and too much left unsaid, I put my head down on my desk. I close my eyes and listen. And sometimes when she sings, I think that I can hear my name. I hear my name as though called from very far away, and every time it is new, a sound I have never heard before. I close my eyes and listen. Marlo Starr is a writer and English PhD student at Emory University. Her work has appeared in The Atlas Review and is forthcoming from Meridians. Follow her on Twitter at @marlostarr.